In order to create the ultimate vision of thicker, fuller hair for her wedding in two weeks, we chose Dream Catchers Hair Extensions with clamps to be able to open and close them in about a month to reset pull them back up in a month without damaging her existing fine, thin hair. Kierstin’s hair would not likely grow naturally past her shoulders as a pattern so I had to create the fullness down around the baseline of her hair. 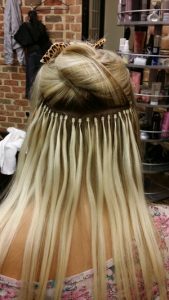 Part of the process of attaching Dream Catchers Hair Extensions is structured application process that is adhered to protect the hair by where the weight of the hair will be balanced out from the areas they are applied in. 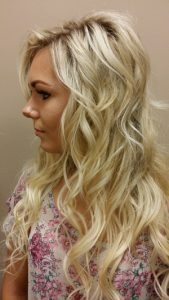 We train all of our extensionists in the art of placement based on the skull structure, hair texture and overall result the client is desiring. We appreciate photos, pinterest, any ideas that help us understand what you want for your big day. We take into consideration how often you color, highlight, and manage your curling iron or heating tools. 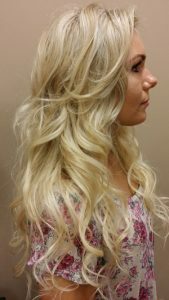 We will discuss in depth how you will maintain your hair every four weeks to return for your color touch up and maintenance on your hair extensions to care for these long term. The Dream Catchers Hair extensions are the best investment because of the durability of the hair. the clamps will be replaced long before the hair will be. As the hair starts to thin after maybe a year, we can replace the hair without a problem. If you get bored and want to try new colors, that is easy enought to replace or change out. We do have to rotate the placement of the extensions to not cause undo stress in the same area if you wear these or any extensions for long periods of time. Long periods of time being 6 months to 1 year or more. We have not had any negative results since carrying and installing Dream Catchers Hair Extensions. We recommend that you sleep on a silk pillow case to enable a “slip” instead of cotton pillow case that can cause natural friction. Before bed, utilize larger looped braids to help take the weight off the scalp where the attachment is located. Constant pulling and tugging can cause them to come out prematurely. Easy enought to reinstall, we would like to not have to do that frequently and prevent breakage unnecessarily. Use scrunchies that are made of material vs the small nylon tight hair bands to prevent tension on the scalp or clamps. Pony tails that are looser to take weight off at night are best. I always say to rotate your ponytails on the top of your head to the right or to the left. These recommendations keep the hair healthy plus prevent your hair from breaking. To cleanse the hair, use a non sulfate shampoo and conditioner. If your scalp is dry, you only need a light cleansing shampoo for the scalp apply using up and down motions vs circular which can cause huge tangling problems if you have not maintained your extensions monthly. Dirt is normally at the scalp where it needs cleansed. Not necessary to over shampoo the hair. Conditioning creams can only be used mid length to ends to detangle and moisturize. Stay away from the slick heavy moisturizers that cause weight. When hair is wet the weight of the hair increases. It takes some getting used to at first. MUST keep condioner off the clamps or any hair extensions or they will loosen the seal where the hair is attached or they will slip out. This can be detrimental to the bride-to-be right before her big day. Best to let hair dry! We do not recommend turban style towel drying. Bend over scrunch the towel with hair to blot the water out of it. The thicker remy hair will hold water and weight. The weight is the problem that causes undo stress and tension on the scalp. Squeeze the water out of the hair immediately when exiting the shower or bath. Styling products can be used as normal. Thickeners on the scalp where the absense of clamps are used is fine. Dry shampoo, dry sprays are best for volume plus texture for the BIG DAY! Hair sprays are not a problem either. We suggest light argan oils, Wella Dark OIls only used on the very ends of the hair if necessary. Try not to use bobby pins or hair pins directly into the hair extensions. All Dream Catchers Hair Extensions are from Scandinavia. Beautiful texture along with high quality from top to botton strands. Minimal to zero fraying of strands. we back all of our hair 100%. If we see fraying we will replace those strands immediately provided you are managing your hair appropriately and reasonably after the consultation. If you have naturally oily hair we will not install Dream Catchers Hair Extensions unfortunately, the natural oil may cause the clamp to slip out. the haircut charge is not included with the Dream Catchers Hair Extension installation. We use separate tools for the haircutting but use the French haircutting methods to craft the haircut that is designed exclusively for you and how you want your hair to look. the hair is heavier than your normal hair. Learning to work with your new hair can take some adjustment time. If you are great with your hair, we will go forward with length to the bra that comes in 22″ – 24″ but does cost more. If you are not the type of person that is good with styling your hair, we will recommend shorter and more volumous styles to make it easier for you to style. 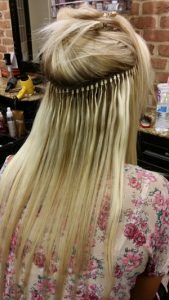 Dream Catchers hair extensions can be colored with multi tones in blonde, browns, caramels because they are human hair. We charge 65.00 + to retouch hair with extensions due to the fact we have maneuver around the clamps, fusions, beads, wefts to protect your hair and the Dream Catchers hair extension hair. We recommend that if you have your hair colored every four weeks that you stay on that schedule. Any longer time in between causes the hair colorist to manage the extended root color differently due to the overgrowth. any more than 1″ can be problematic plus expensive. Stick to the maintenance program and you will be fine. 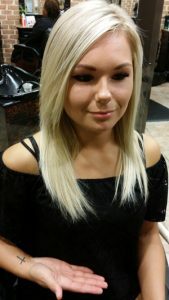 We will only guarantee our color and hair extension work not another salon’s work. 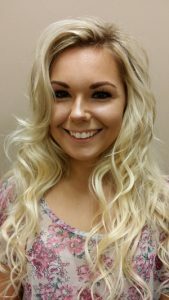 Any of our hair extensionists can install the Dream Catchers hair extensions that are trained by Kimberly Acworth the Master Cosmetologist. We will expect 50% down to pre-order customized hair. We will give you a gift card with the amount of your deposit. the balance is due at the time of service for hair extensions. all additional services such as haircolor, highlghting and the haircut are separate charges. We will provide all hair coloring services prior to installation of the hair extensions. Minimum 5-7 days prior up to the day of service. Haircoloring does not hurt the extensions. the additional texture helps lock in the grip to hold extensions. Please note – we may or may not be able to purchase more than 24″ of hair depending on demand from specialized manufacturers. We can get you bright rainbow colors on demand. The color may fade over long time plus how you manage the maintenance of shampooing with the right shampoo and conditioners. We cut Kierstin’s new hair extensions as we would her own hair so that she can curl, pull up, smooth and straighten with all of her blow drying accessories plus curling irons to manage her styles. 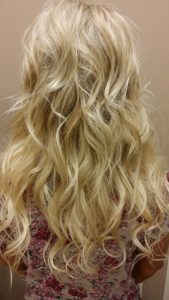 The hair will grow about 1/2″ per month normally and will need to be trimmed in areas that are more obvious to needing volume such as the bangs or top of the head and crown. Dream Catchers has special clamps that have insulated for fine hair to help protect hair that might be fragile therefore protecting the actual hair strand. We already chose the right color clamps that closely matched her hair so it would be detected in appearance whether she curled her hair or straightened it. We did a test by pulling the hair up on the sides, pulled it back into a pony tail to check all angles with confidence nobody would see them. Trial Updo’s are the perfect way to see if you like what you chose for your big day. Great way to see how it feels, the weight of your hair on top of your head and does it hold up for you. Great for last minutes changes to update accessorizing. Schedule 1 month in advance to 10 days prior to any last minute ideas to try out. Having your bridal makeup can make a difference too. Getting organized with the right colors, tone of lighting in addition to wearing the eye makeup or lip color can help you be more comfortable on your big day with confidence because you did the trial run. You know what to expect. Allow about 1.5 hours for time to discuss then play. We use Glo Minerals Makeup for our Bridal Makeup because it can be layered, photographs well plus it’s easy to use. Can be scheduled same day or different days. Allow 1 hour for makeup application. Kierstin felt beautiful when we were finished. She couldn’t believe this was her with her new hair.